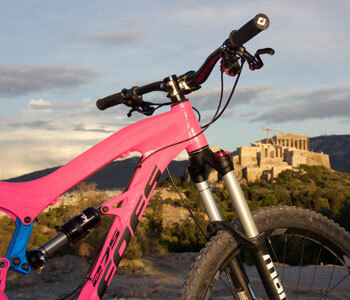 Bike & Hotel Athens and Surroundings: Athens is one of the oldest cities in the world! Its geographical position has greatly influenced the entire ancient Greek culture. The city of Athens lies in a plain and is surrounded by small and larger mountains. The highest mountain is Mount Parnitha (1,443 m of altitude), followed by Mount Hymettos (1,026 m of altitude) and many smaller hills such as the Pnyx, the Acropolis and the Philopappos. 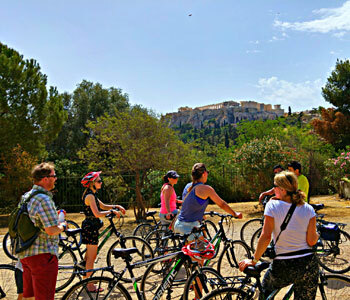 Biking on the historic trails in and around Athens is a true journey through history as the trails lead into a very modern city that has been planted at the same place for thousands of years. 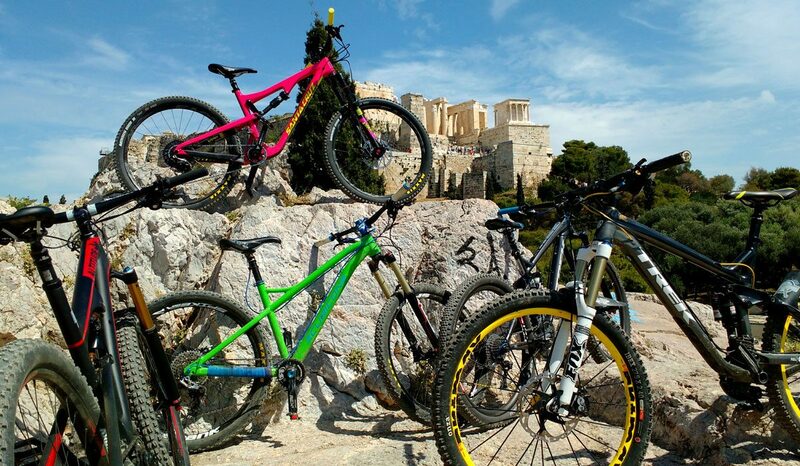 The aim of this bike week in Athens and its surroundings is to combine urban life with mountain life. A difficult combination made possible by the favorable geographical location of Athens. 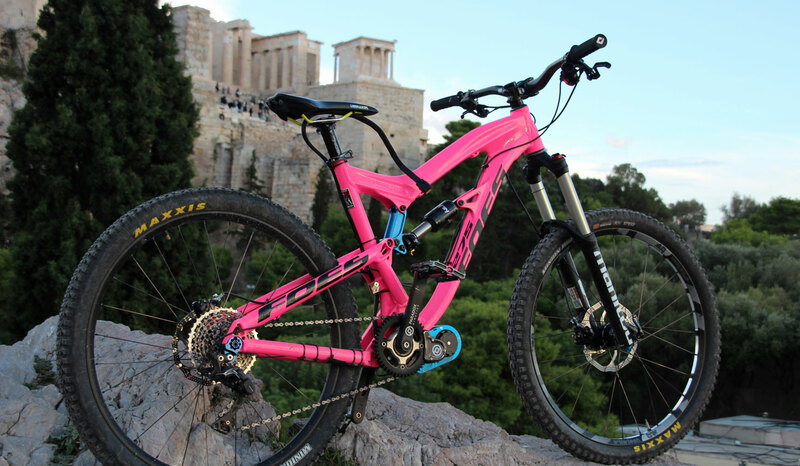 The acropolis and the ancient agora in the center of the city, lively places where ancient and modern Athenians met and meet, are the perfect contrast to our mountain bike tours. But even far from the city you will always find fascinating historical references: for example, from these mountains comes the marble from which the Parthenon and the ancient statues originated. The wood from which ships were built for campaigns over the centuries came from Mount Parnitha. On our journey through time, you will experience Athens not from a tourist perspective, but with an insider's view, and thus get to know the city both historically and presently, and see how bright the future of Athens looks. Where once the ancient Greeks lived and wrote world history is now a cosmopolitan city worth discovering! 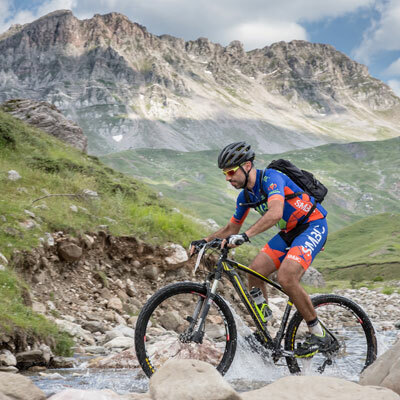 If you are interested in this bike adventure, please send us an email request with your preferred tour date at least two months before your desired date: moustakasbikes@gmail.gr. 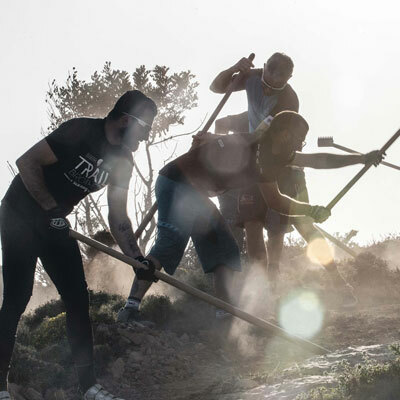 The price of 650 Euro per person applies from a minimum of 5 participants. The tour is also possible with fewer participants, but at a higher price per person, which you will receive upon request. High-quality rental bikes are available on request at a daily rental fee of 35 euro/bike. 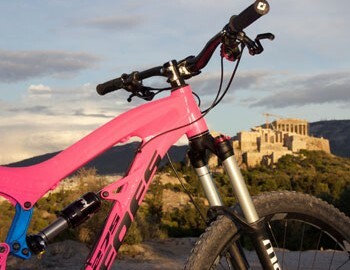 • Experience Athens from a real insider perspective! • Bike through the millennia! • Enjoy the contrast between the lively city center and the tranquility of the mountains! • Try the Greek Mezés! The incredible variety of appetizers will probably completely change your mind about the Greek cuisine! 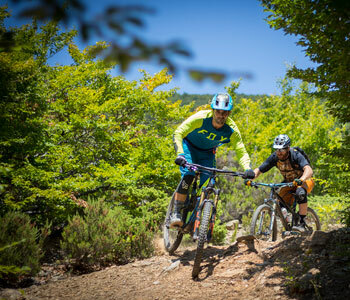 On this tour you are accommodated in carefully selected bike-friendly hotels that have the facilities needed for bike travellers and their bikes, to provide the best quality services for them. 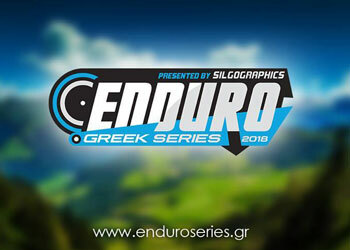 Guided / Multi-Day / Enduro: A 3-day bike adventure – sacrifice a little of your comfort in return for a unique experience! 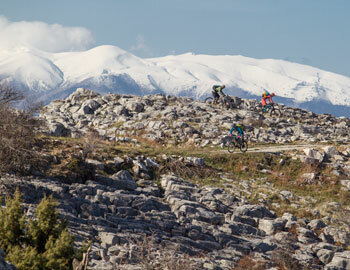 Shelter & Bike - Athens & Mount Parnitha Wildlife Tour: Just 20 kilometers from the city center yet we are so far away! 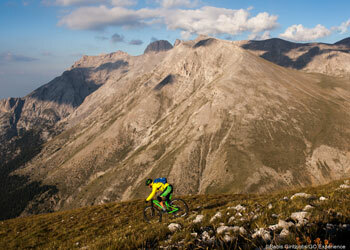 Parnitha is the highest mountain in the surroundings of Athens and a mountain biking paradise! This program aims on bikers who are willing to sacrifice little of their comfort in return for a unique experience. The shelter of Bafi, located at 1161 meters above sea level on the eastern side of Parnitha, is fully equipped for overnight stays. The paths around it have quite a history to tell: they were in ancient and medieval times often frequented by wandering flocks since Parnitha was a forage area, in the 19th century they became the domicile of fugitives and robbers. 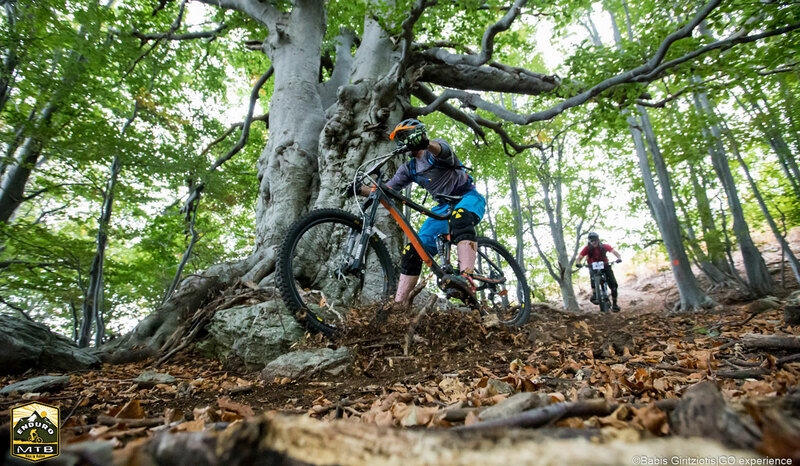 Today Mount Parnitha is a popular place of excursions for the Athenians, but more and more also for bike lovers from all over the world. Nevertheless, our journeys will start from the city center. This 3-day tour is also a journey through Greek history. Starting from the Acropolis and the places where the ancient philosophers walked, before we head to Mount Parnitha, which played an equally important role in shaping ideas. Staying overnight in Bafis mountain shelter gives us the chance of a true experience of the mountain, a morning awakening with freshly fallen dew and a contrasts with the city below us that couldn’t be any bigger. 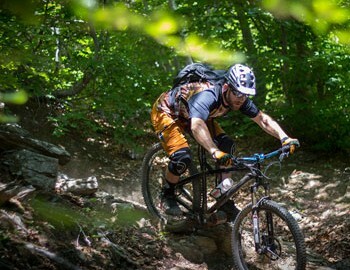 The trails on our bike rides have a great variety. High up around the shelter and the peaks of Mt. Parnitha we find to the left and right of the technically demanding paths black firs, which grow only on the Ionian Island of Cephalonia and here on Mount Parnitha. 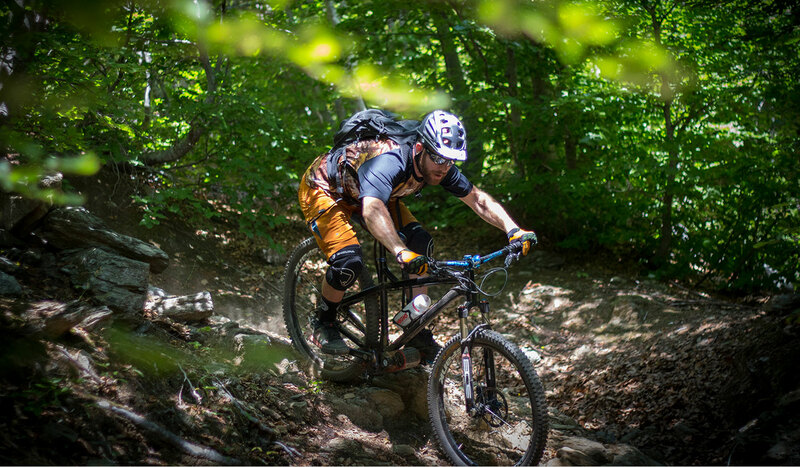 Losing altitude we will access some paths that proof the excellent work by local trail builders and we will have some great trail experiences on the tracks which are used by all kinds of mountain bikers. 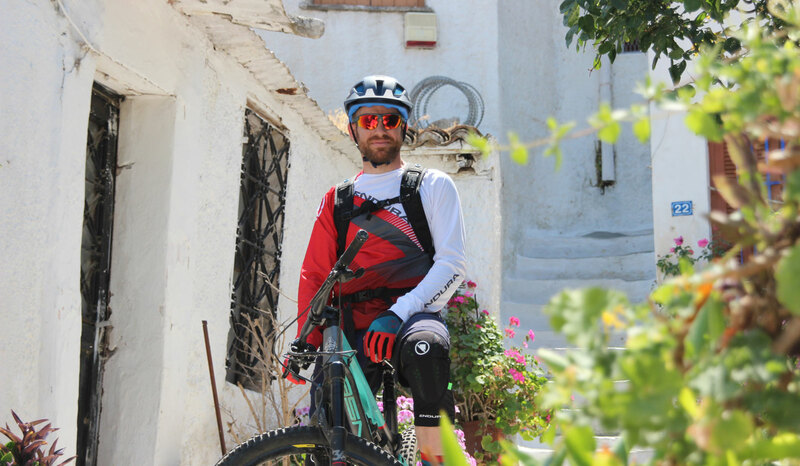 If you are interested in this bike adventure, please send us an email request with your preferred tour date at least two weeks before your desired date: moustakasbikes@gmail.gr. The price of 345 Euro per person applies from a minimum of 5 participants. The tour is also possible with fewer participants, but at a higher price per person, which you will receive upon request. 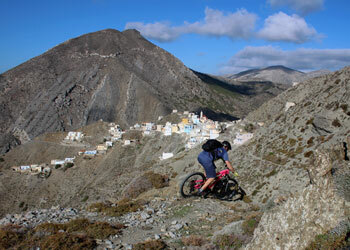 High-quality rental bikes are available on request at a daily rental fee of 35 euro/bike. Your accommodation on this trip will be the mountain shelter of Bafi, located at 1161 meters above sea level on the eastern side of Mount Parnitha, which is fully equipped for overnight stays. It is not a luxury accommodation, but perfect for nature lovers who are willing to sacrifice little of their comfort in return for a unique experience. 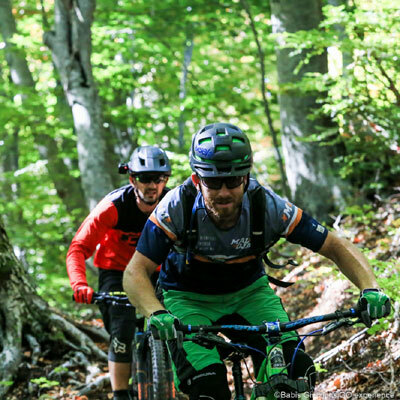 Guided / Multi-Day / Enduro & All Mountain: A thorougbred bike & hotel experience by Montis Ordo to Athens, Pelion and Mt. Olmypus. 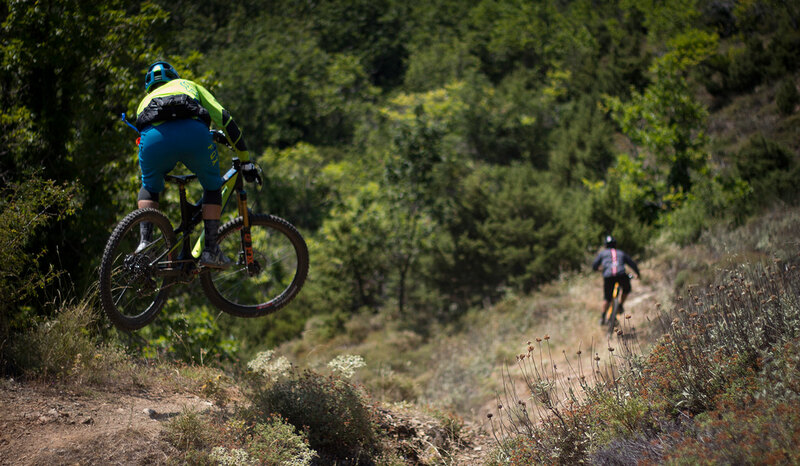 Enduro & All Mountain Bike Adventure to Athens, Pelion and Mt. Olympus: Greece is well known for its 3,000+ islands, its colorful history and its poets and philosophers. After visiting Greece, it is the unique light tone which will forever remain in your memory. 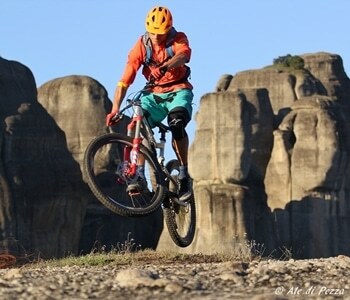 However, what the majority of people are not aware of is: how incredible Greece is for mountain biking, especially on the Greek mainland, where this exceptional MTB & hotel tour takes place. 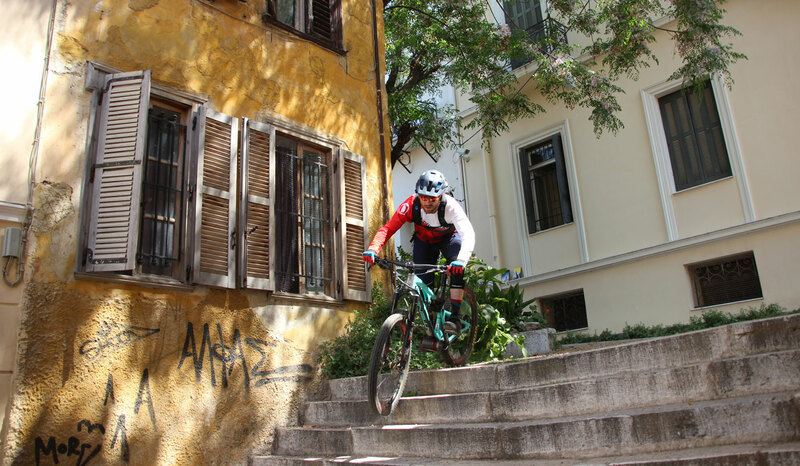 The famous capital of Athens, and it’s not so famous, yet incredible MTB possibilities in the nearby surroundings are just one of the many highlights on this tour. After acquainting yourself with this impressive metropolis, your journey takes on to the Pelion Peninsula in central Greece – a Garden of Eden on earth and a trail paradise at the same time. A world where sprawling nature gives way to mountainous landscapes, yet the blue of the ocean is never far from sight. The crowning highlight to the tour however is an outing to the nearby Mt. Olympus where a bountiful trail network awaits your arrival. 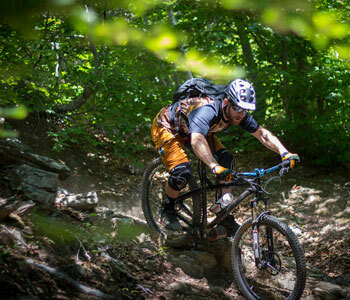 This tour is characterized by grueling climbs followed by endless descents with the majority of trails demanding a high level of technical ability. The target audience for this MTB experience to Athens, Pelion and Mt. 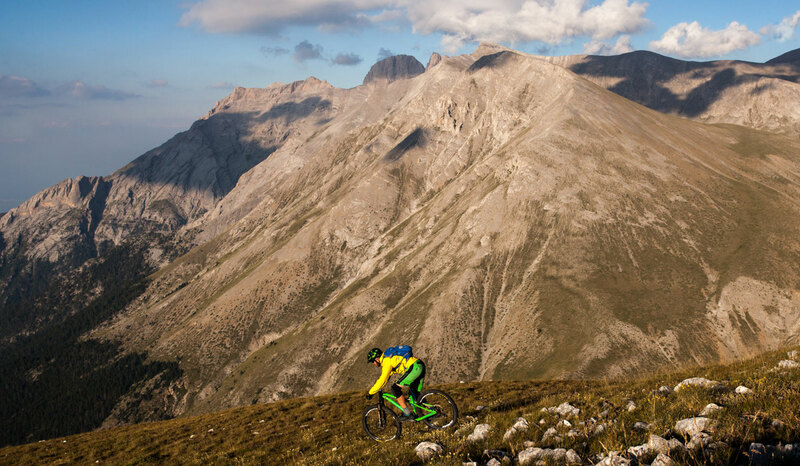 Olympus are all-mountain and enduro riders looking for an adventure to conquer. On this bike & hotel tour participants will be accommodated in bike friendly hotels who provide a secure bike storage and washing station for visitors with bikes.